Thanks to Joshua Jonathan, I have discovered the paper Massive Migrations? The Impact of Recent aDNA Studies on our View of Third Millennium Europe, by Martin Furholt, European Journal of Archaeology (28 SEP 2017). New human aDNA studies have once again brought to the forefront the role of mobility and migration in shaping social phenomena in European prehistory, processes that recent theoretical frameworks in archaeology have downplayed as an outdated explanatory notion linked to traditional culture history. While these new genetic data have provided new insights into the population history of prehistoric Europe, they are frequently interpreted and presented in a manner that recalls aspects of traditional culture-historical archaeology that were rightly criticized through the 1970s to the 1990s. They include the idea that shared material culture indicates shared participation in the same social group, or culture, and that these cultures constitute one-dimensional, homogeneous, and clearly bounded social entities. Since the new aDNA data are used to create vivid narratives describing ‘massive migrations’, the so-called cultural groups are once again likened to human populations and in turn revitalized as external drivers for socio-cultural change. Here, I argue for a more nuanced consideration of molecular data that more explicitly incorporates anthropologically informed mobility and migration models. I was copying and pasting whole excerpts to post them here, but I think it is best to read the full paper. It is a great summary of potential flaws of the current reasoning in genetic papers. It should be a must-read for any serious geneticist involved in discussions on migrations, especially regarding archaeology in Indo-European studies. 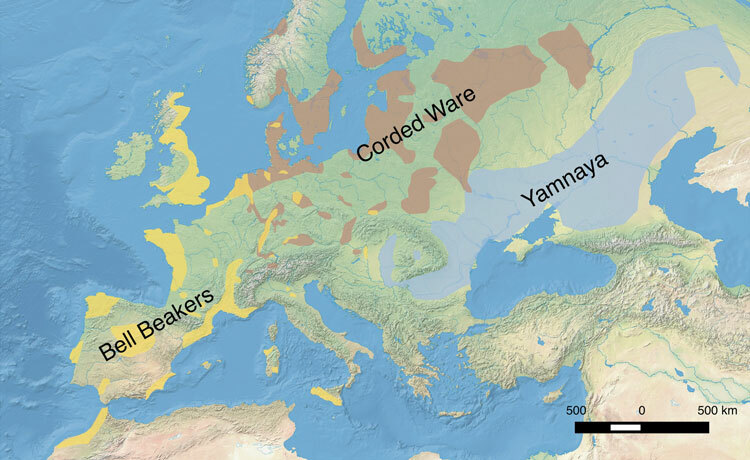 As for the answers to the paper, well, unsurprisingly quite disappointing that of Haak, neither addressing the main flaw of their proposed “Yamna -> Corded Ware migration” model, nor taking the opportunity to evaluate other potential models fitting their findings of steppe ancestry in Corded Ware peoples, not even those directly suggested to them (like the expansion of Suvorovo-Novodanilovka chiefs). #EDIT (30 DEC 2017): Check out the interesting article by Bruce G. Trigger, referenced by John Hawks, about the question of descriptive vs. theoretical archaeologist vs. ethnologist/anthropologist from the 1950s to the 1980s. Interesting to see how today the new playboys in Academia, geneticists, are playing the archaeologist playing the ethnologist playing the linguist in Indo-European questions, and how we are living a historical debate on essential questions for the future of all these disciplines.